I don't know if you've noticed, but it's been a hot summer! The average high in Raleigh last month was 94.5, and we had 7 days at 100 degrees or higher. Yuck! Well, it's time to start planting my fall garden. I don't have a lot of space so that meant tearing out some plants that weren't necessarily done producing. 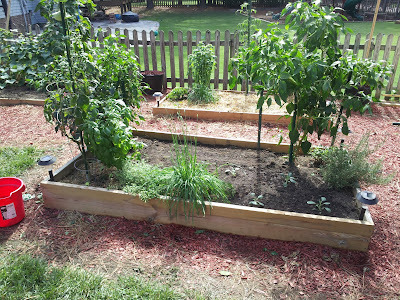 I also needed a place to plant some cabbage and radishes, so that meant I needed to remove some peppers from the pepper garden. I left myself with one cayenne, one jalapeno, and one anaheim chili, and made plenty of room for four Tropic Giant cabbage starts, and some radishes. I've never grown any of these items before, so this is all new! I've also given up on the second crop of zucchini - the bugs really destroyed the stem of the plants, I don't know what kind of bugs.. squash bugs probably. Anyway, it just didn't work out. 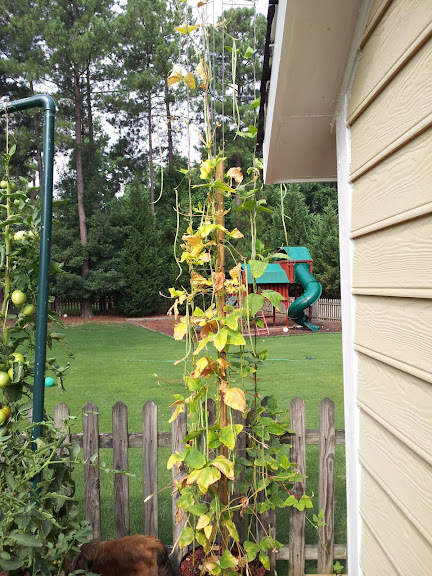 Also, my bean trellis fell over (broke). I took this as an indication that it was time to clean that garden out too, so I removed the zukes and beans, leaving only the cukes. I will probably plant some garlic and onions here soon. 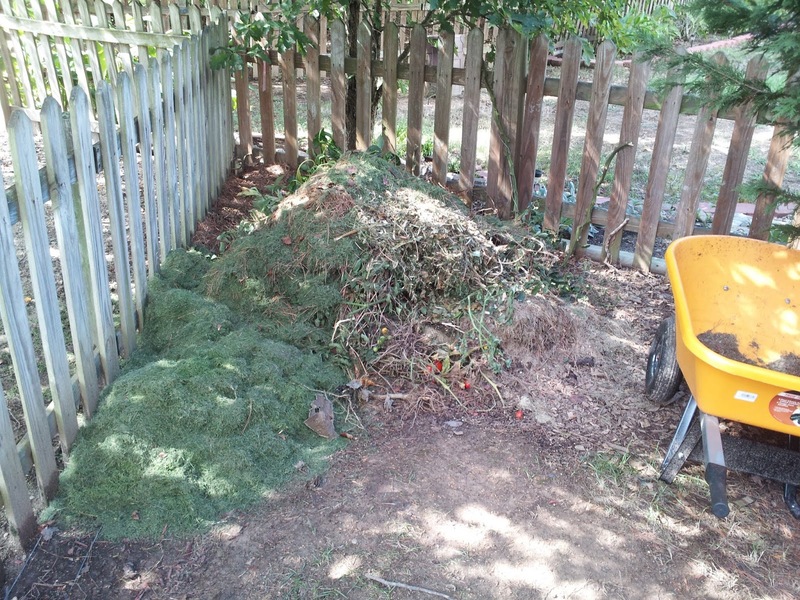 Finally, here's a picture of my growing compost pile! 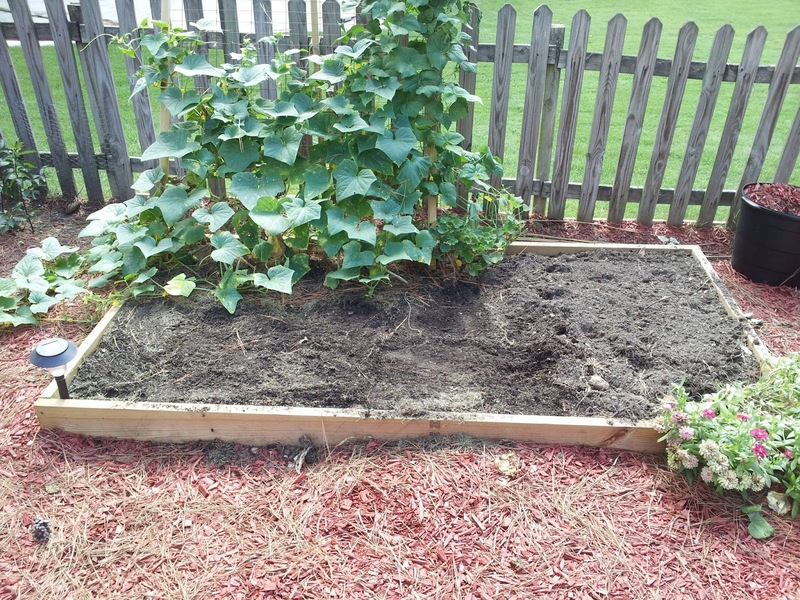 I re-planted two new zucchini plants (Black Beauty) and some unspecified variety of pickling cucumbers a few weeks ago. I got the starts from the farmer's market. 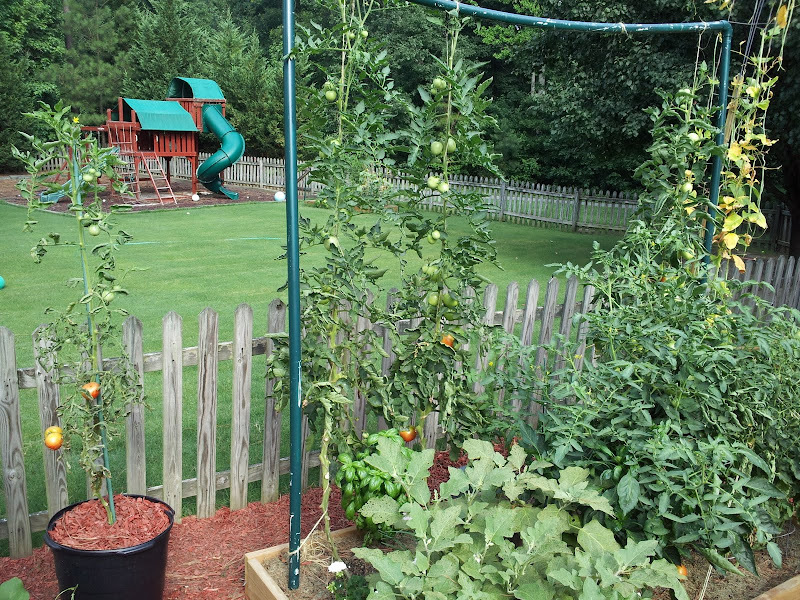 The big beef and early girl tomatoes in the raised bed here have reached "maximum height". 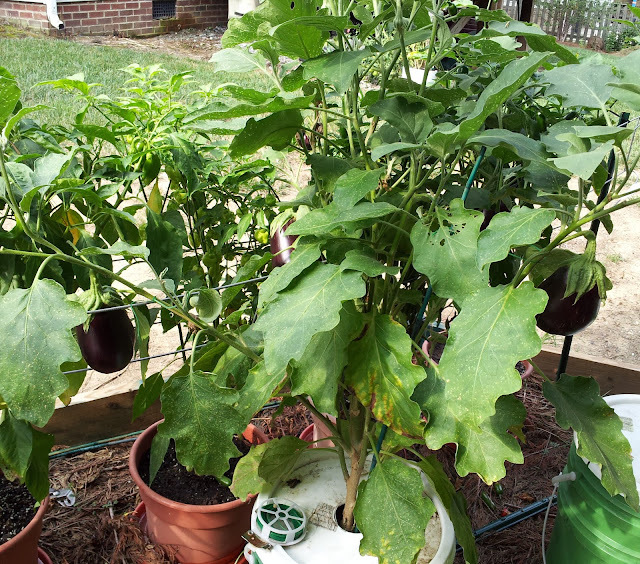 I transplanted another heirloom tomato in the middle a few weeks ago and it's almost to the point where I need to string it up. Aside from some cracking, the tomatoes have been great! Also in this picture, a couple of eggplants, a bell pepper, and two extremely vigorous Celebrity tomatoes. 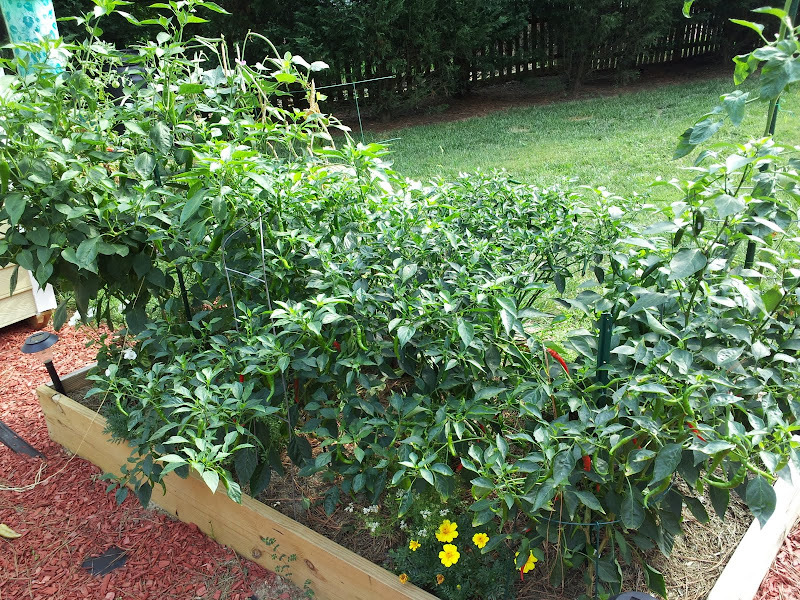 I have been taking huge amounts of peppers off these plants lately! Sent a whole bunch to work with my wife yesterday (I took a bunch to work the week before). 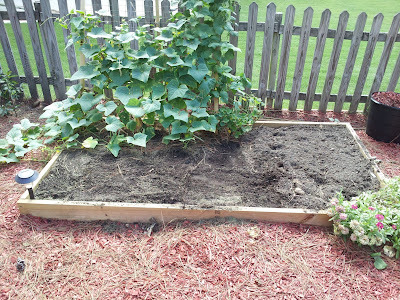 This is what's left of my Asian Yardlong Beans, aka Asparagus Beans. I harvested most of them a few days ago and froze them. I was very impressed by this variety, it was extremely productive and did very well in this setup. That's a 2x2 with three pieces of 10' galvanized "mason ladder" wire. The beans went all the way to the top! Two heirloom tomatoes that I don't have any place to plant. They're in little 4" round jiffy pots and I water them twice a day. They're doing surprisingly well considering how tiny their root system is. As long as I can keep them alive I guess I'll keep them going. 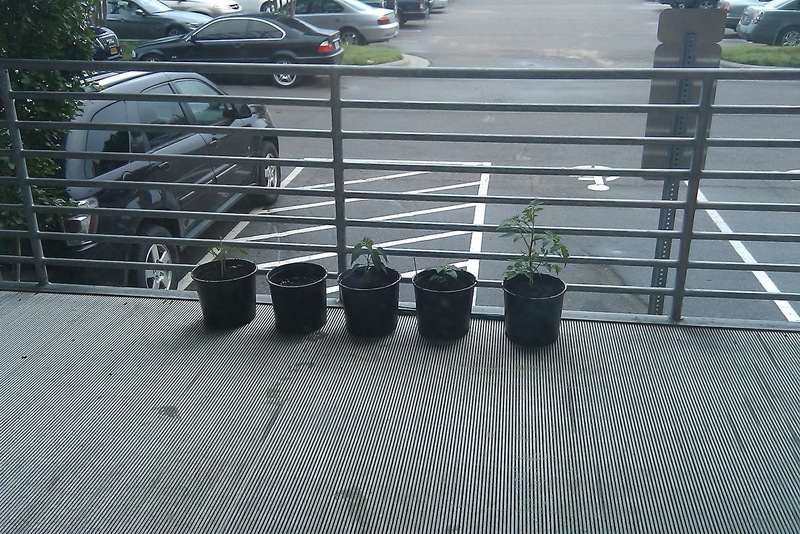 My container garden - the cherry tomatoes on the left have maxed out their height. 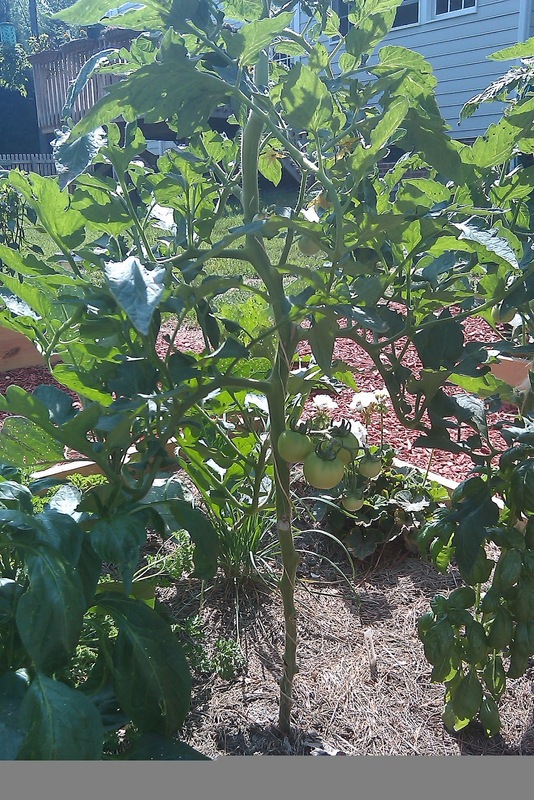 The grape tomatoes on the right have another foot to go. The peppers are mostly doing well too except the bell peppers in the pot on the far right are suffering from dwarfism I think! And some of the bell peppers and anaheim chilis have gotten blossom end rot (but not all). The habaneros and jalapenos are doing great though, as is the eggplant (see next picture). Compared to the three eggplants I have in the raised beds, this one is doing far better. It's taller, greener, sturdier, and has more fruits. It never suffered much damage from the flea beetles like the ones in the garden. 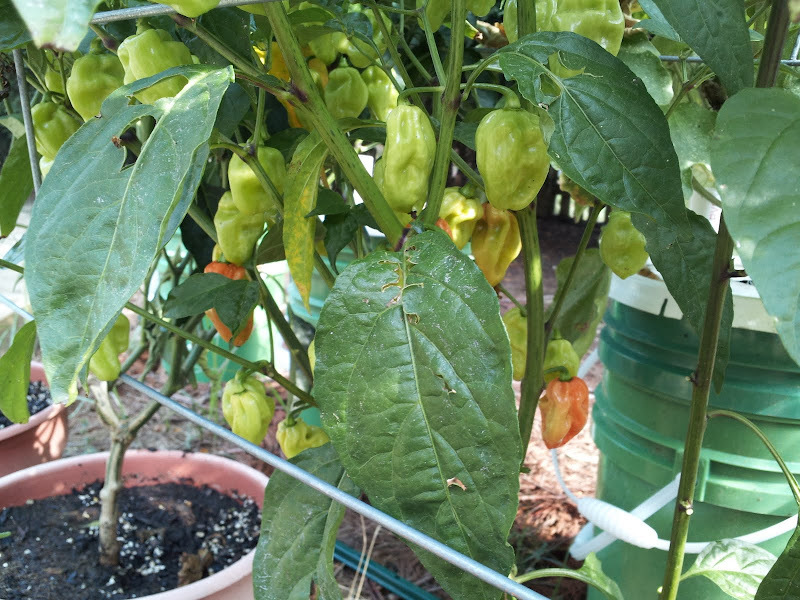 My habaneros are starting to ripen up! I finally have a canteloupe, too. I only ended up with one last year too, this was a last minute addition and is not in a prime location.. the soil is poor, it's hard to water, and it doesn't get "full sun". I must've tossed some rotten tomatoes over here last year because I have a "volunteer" growing. I wonder what kind it is! It's got some small tomatoes on it that just appeared so I'll find out soon enough! The above bug is a squash bug. So, it's not surprising that I found it on my zucchini. I found and squished 5 or so more of these nasty little bugs. This little thing is a cucumber beetle. 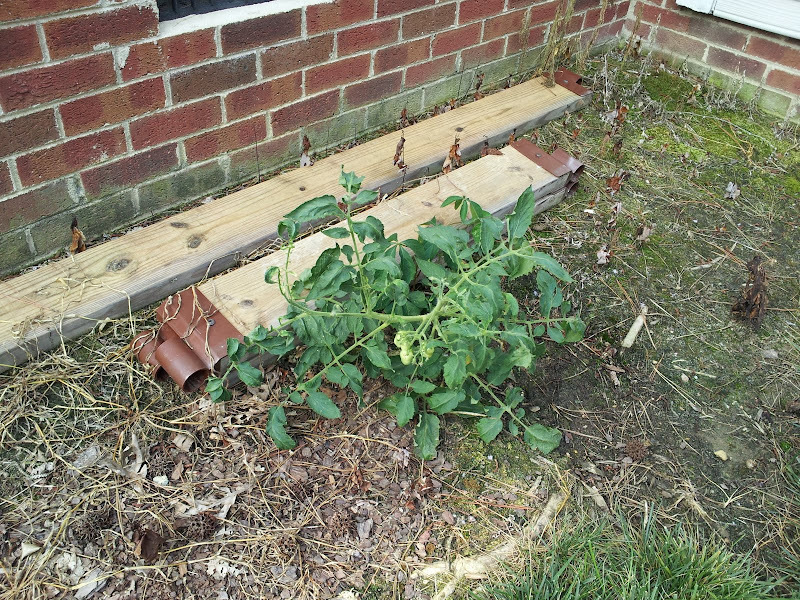 Extremely nasty because they spread a plant disease called bacterial wilt, and if your plants get it, there is no cure. It's the death of your plant. Even though this is a cucumber beetle, I found this particular one on a zucchini leaf. Cucumbers and zucchini are closely related. Also in the picture above, in the upper right part of the leaf, you can see some eggs. These are squash bug eggs. I found numerous deposits of them and removed them. I'm sure there are more. From what I understand, this is a battle I'll be waging every day now. Of course one organic tool for battling these bugs is simple removal. Find 'em and squish 'em. Another is the use of insecticidal soap. 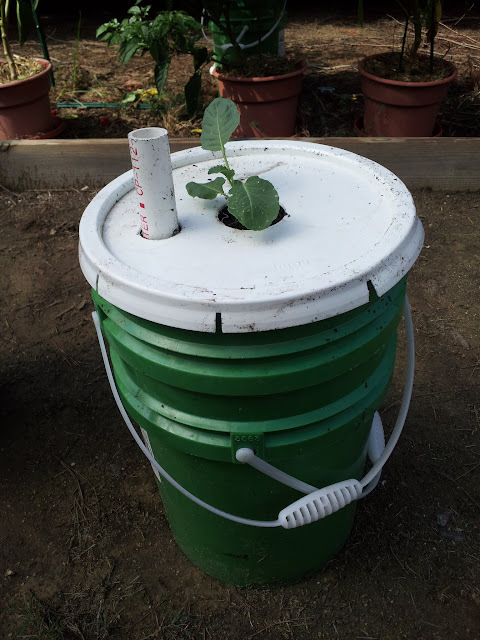 I have a bottle of orth essentials insecticidal soap but I have a lot of leaves to cover, so I'll be picking up some nice friendly liquid soap of some kind and making a soap spray that I can put in my tank sprayer. And then, I will probably spray the plants every few days. Or more. 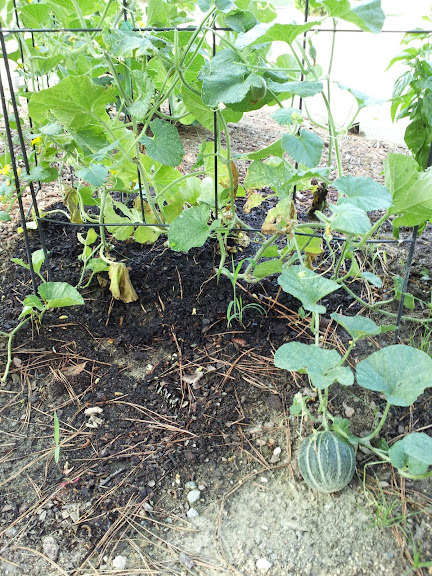 Another way to fight squash bugs is to trap them. Apparently, if you put a few small boards in the garden on the ground, at night the squash bugs will congregate underneath the boards, and you can kill them. Maybe in the morning, or maybe late at night after sundown, I'm not sure of that yet. I put a few boards out there this evening and I will check them tomorrow night after it gets dark. The good news is that my zucchini and cucumbers are all very vigorous and healthy, and as long as I keep on top of things, they won't suffer at all. They could lose a few leaves easily and not be bothered. Heck, I've removed a number of leaves just to let the sun shine on the beans! So, the string trellis method is working nicely but you do have to pay close attention to the suckers!! 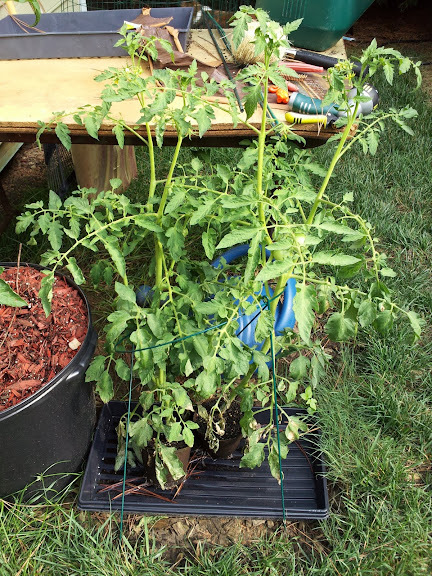 I have 10 tomatoes that need to be pruned and I check them every few days =) As the plants have gotten bigger and taller, I've also started to remove *all* growth below the bottom fruit/flowers. 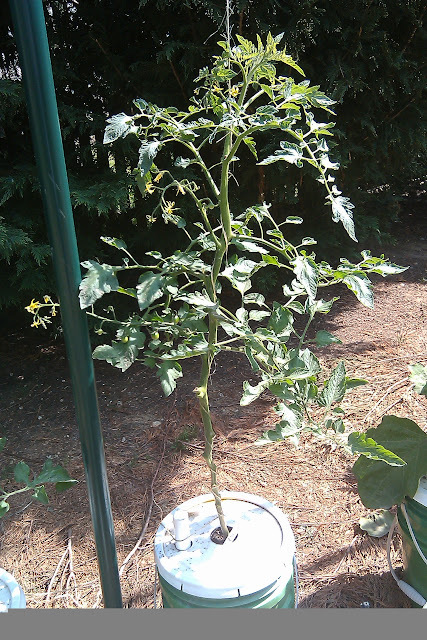 This should focus the plants energy on the maters and keeps the leaves well up off the ground too. 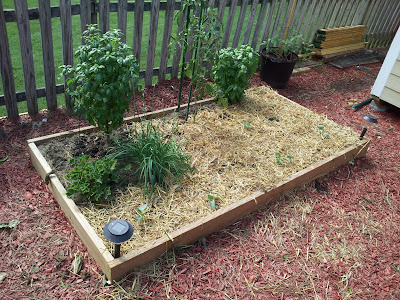 Diatomaceous Earth, or "DE", is a naturally occuring material that, among other thins, is a fine organic method of garden pest control. It's perfectly safe for other animals and humans, but insects that come in contact with it die. You can read more about it on wikipedia if you like, just do a google search. Anyway, it's a powder and I wasn't sure the best way to apply. I saw a video by Patty Moreno (Garden Girl TV) and she had a fancy hand-cranked crop duster. Now, I don't have anything like that but I didn't feel like using my hands would truly do it justice. So, get yourself a plastic water bottle with a screw on cap (not a fancy reusable water bottle, just a regular old bottle of water). Make sure the bottle is dry. Drill a couple of very small holes in the cap. Use a funnel or something to fill the bottle with diatomaceous earth, not more than 3/4 full. Screw on the cap, and then holding the bottle sideways, squeeze it repeatedly to "puff out" the dust. Part 2 - Tomatoes, suckering tomatoes, eggplants, companion gardening. 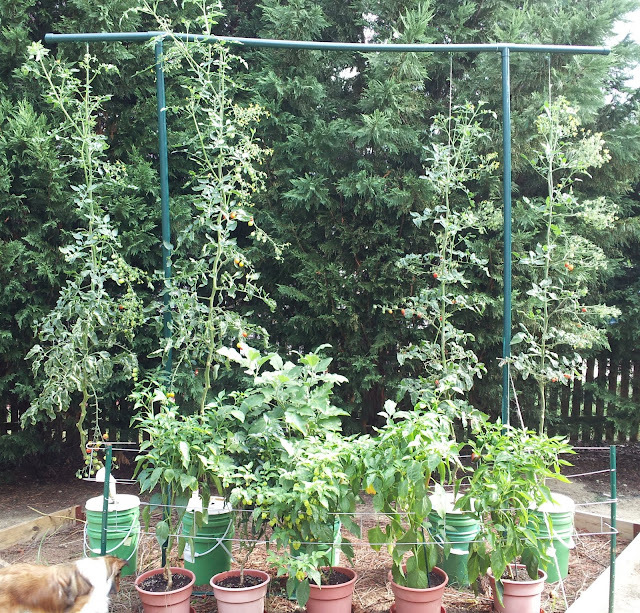 Tomatoes on the completed string trellis - 2 Big Beef Hybrid and 3 Early Girl Hybrid, plus two bush style Celebrity tomates (small cages on the right). This garden also has a couple bell peppers, eggplant, and various herbs and flowers. Topsy Turvy (Roma) tomato. Leaves went back towards the sun after a day or two of being upside down. I don't really have anything to report on the gardening front from this weekend, but I did do some garden related projects! 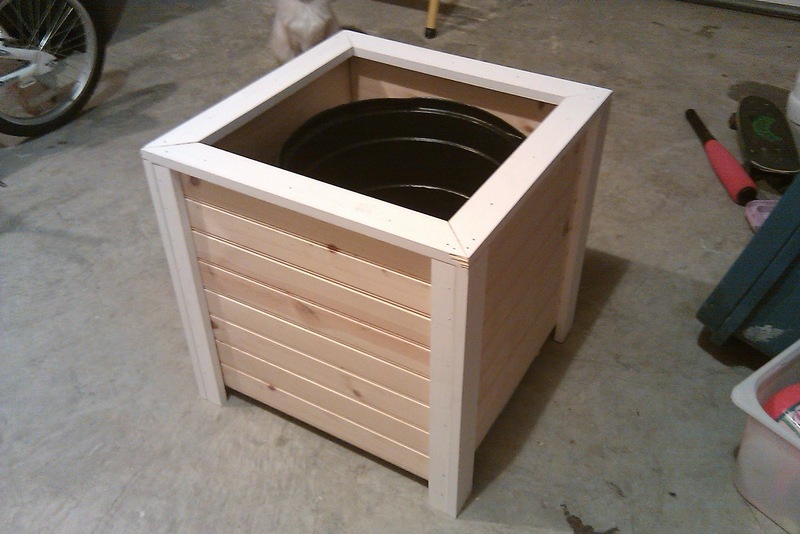 Saturday morning, I made a compost tumbler. I found a guy on craigslist selling 60 gallon food grade barrels with screw top lids a couple weeks ago and I picked one up to make my composter. I picked up the other materials I needed Saturday morning - pressure treated 2x4 lumber, some scrap pressure treated 1x6 decking, a 48" piece of black pipe, 2 end caps to fit the black pipe, and a 2' piece of PVC pipe (just large enough for the black pipe to fit in it). I'm not going to go step by step here, but basically I made a nice frame, drilled (in the barrel) a few 7/8" holes for the pipe, a few more in the bottom for "large" drain holes, and then a whole bunch of 3/8" air holes in the sides. Here's the finished product! 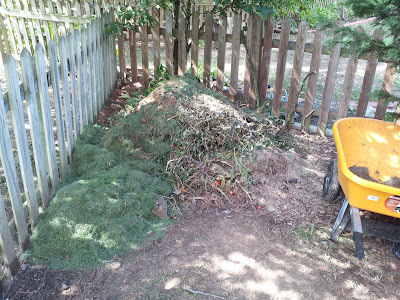 I've got it about half full of stuff right now - mostly green grass clippings, along with some twigs, leaves, crushed pinecones, stump grindings (aka sawdust) and some shredded cardboard and coffee grounds. Hopefully in a few weeks I'll have some nice compost! Another weekend project that I did last night, using my 18 guage brad nailer was a deck planter. I'd gone to the hippie gardening store on Saturday because they sell cheap black nursery pots, and I wanted a BIG one. The largest they had was a 13.67 gallon pot, which cost about $5 - heck of a lot cheaper than anything Home Depot sells at a similar size, I can tell you that! Then I did head over to Home Depot for some wood. I had a picture in my head but no plans of any kind. It still needs to be painted (the white stuff was pre-primed), but overall I think it turned out pretty nice! I enjoy gardening a lot more than I actually enjoy eating vegetables. Certain things I like eating more than others, like I really enjoy FRESH cucumbers and zucchini, but I'm not a huge tomato fan, and I really don't eat hot peppers at all. And yet, in my garden at home, I've got 13 tomato plants and 11 hot pepper plants. Why? Well, because they're fun to grow! But instead of pawning my excess vegetables off on neighbors, I think this year I'm going to donate my extras to the Inter Faith Food Shuttle's "Plant A Row for Hunger" program. They gladly accept donations of fresh produce, with only a few restrictions (primarily, no pesticides in the 2 weeks prior to harvest). I found out about this program by doing a simple google search for "donate produce durham". Maybe your area has a similar program! My office building is a converted tobacco warehouse in Durham, NC. We've got a covered patio that gets direct sunlight from dawn until about 2pm due to the NE/SW orientation of the building. I'm going to try doing a little container gardening out there in 3 gallon pots. Right now, I've got three peppers (Habanero, Cayenne, Anaheim Chili) and 2 tomatoes (Celebrity, which is a determinate variety and Supersweet 100, an indeterminate cherry variety). 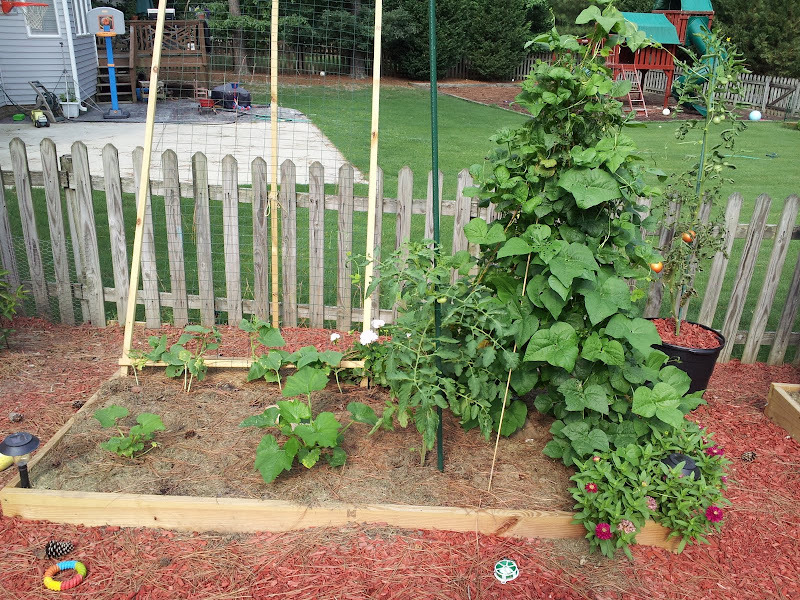 I might also get a couple more pots and try some pole beans and cucumbers. There is a nice steel rail out there for some support. These pots will most likely NOT get watered on the weekends, although I do have one co-worker who lives in the complex and may be willing to water my veggies on hot weekends. The summer temps often exceed 90 degrees here (in fact last summer we set a record with 93 days of 90 degree highs!). So hopefully a good dose of water on Friday afternoon will get them through the weekends. So, just a quick update here. I was out of town this weekend and when I got back my basil had grown up to the top again, about a half inch below my light, so it was time to harvest again. I bravely cut back an enormous amount of foliage. Here's what's left, what I harvested, and today's "Roots" picture. Click on any image for a closeup! My last hydroponic basil update was 10 days ago. The plants were getting quite tall except for the one that had experienced some insect damage while it was still a seedling in the peat pellet. A day or so after I posted that update, I decided I had to punch the plants back to try to keep them shorter - after all, I only have a single 24" T8 grow light and not much sun in my window. So I pinched the top set of leaves off each plant, and I've really been amazed at the growth over the last week. They're nearly as tall as they were before but each plant's stem split into two new stems. In other news, I've had to adjust the pH once, but I haven't added any more nutrient solution. The water level has dropped about an inch, but the roots are hanging right down into it and the air bubbler helps spray some bubbles up onto the roots as well. Here are some new pictures. This first one is a closeup of the plant that had the insect damage and was somewhat stunted. You can see the cut and where the stem split, and look at how much it's grown! It's bigger than the other three now. And it wouldn't be a hydroponic update without a picture of the roots!